So, am I the only one who thinks Mark of Heaven's favor + Lonely Dojo is a ridiculous economy boost? MoHF increases a numeral by one. Like I dunno, bow produce 1 gold? it applies to all other holdings the same way. Effectively reducing all your follower costs by an additional 1 for the rest of the game is meh?! We may be looking at different wording? After you Equip a Follower paying 1 or more Gold, give this Holding +1GP (this turn). After you Equip a Follower paying 1 or more Gold, give this Holding +2GP (this turn). That means that if you attach a 2g Follower (paying with a different holding) you come out even. And if you resolve the spell on another copy of the holding attaching Followers becomes profitable. It's definitely something worth testing, especially with the apparent strength of the Shugenja only or fearless Followers. Your version is conditional, for the same benefit??? this holding. this turn. Its not global and it doesnt last, so bookkeeper is hands down a better candidate? The trait isn't once per turn, and if you were planning on abusing it you would design the deck to take advantage of that. Anybody else notice the MRP wording on Nexus of Lies? 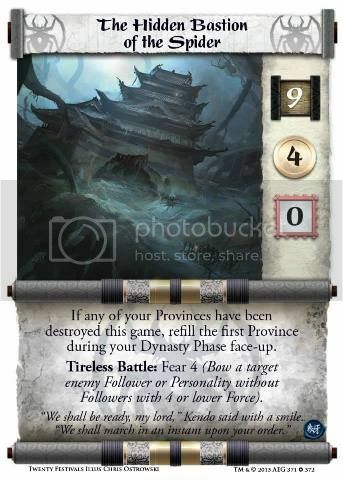 Before another, non-Spider Clan player loses Honor from a card he owns, increase the loss by an amount equal to half his Starting Family Honor, rounded down (this doesn't allow them to ignore Honor Requirements). It's cool that they're thinking of us, but are we really ever going to have 2FH? Maybe to prevent us getting hit with a standard loss that gets bumped up to something higher? I guess it's nice, can't complain. cards stronghold trait instead of this little trick. Eh, if nothing else it lets Susumu run honor loss stuff without getting extra hammered by Nexus. ....because running Honor Loss stuff in a Honor deck that starts second, gains honor at a snail's crawl, and has mostly 2PH Personalities is a GREAT idea. Nexus' updated trait is entirely meaningless for us, our Military decks wouldn't lose any Honor from it anyway, and it's not really beneficial to run honor loss stuff in Susumu. It's actually probably just to prevent someone trying to be very literal. 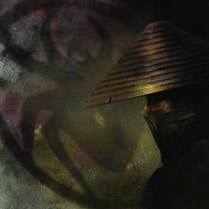 Technically, if a Spider player running a Sensei that decreases starting honor by 1, he would be at -1 Starting Honor. Thus if he loses honor from his own cards, he would be increase the loss by -1 (-1/2 rounded down), for a some total of reducing honor losses by 1. I don't know if anyone actually tried to play it that way, but by RAW that's how it could be interpreted. Couldn't Doji Tashihime also cause us a 1 honor loss? Our loss, Nexus as an action that makes us lose 0 more honor, then her interrupt to make it 1? I actually hope that will change this arc. Sorry guys. Not having played in a few months, whats everyone's thoughts on the Short Season event against political/control decks? Each player may take only one Limited or Open action per turn (after this Event enters play). Open: If you have not taken an action this phase, put this Event into play. Discard it after the current active player's next Action Phase begins. Considering IE and most likely the early part of 20F will be all about pumping as many guys onto the board as possible, I think it's a pretty crappy event. The threat of running this guy in will give an opponent food for thought. Decent force to gold too. This is a little better than Bayushi Aibako because the Spider common personalities are so good. The fear effect is big enough to hit every common personality and follower. Gunjao is a big game and worth the honour loss. The ability is fairly flexible in it’s application but whether the numbers make it worthwhile is another question. they're a lot more positive about Gunjao than i am, and no review that fails to make the "Lao-she is Lou-sy" is really doing its job in my opinion but i'm curious if others agree. they seem generally more positive about spider than we all seem to be. I think Gunjao is really good, he is one of my favorite persobalities this set. He is cheap and has an amazing action by ivory standards, regardless of cost. Lao-she on the other hand leaves a lot to be desired. My biggest problem with a lot of our personalities is that we got a lot of extremely generic low force, low cost personalities this set like gaibu and lao-she. The 4-5g slot already had a lot of competition and these guys don't add much for our decks. don't know if I missed anything or this was already announced but has anyone noticed the change to our stronghold again ?? I don't know if somewhere along the line we were planned to be super powerful with a fear 4 on our stronghold and a prov strength of 9 but both are gone now according to the previews ? I think they upgraded the SH to 9 PS and F4 late in the cycle, so there are some old relics that still have us at the old stats. As far as I know, we are 9 PS, 4GP, and F4. i hope so, also according to the previews there are a lot of sets with advanced warnings in them, is the bann hammer lifting on that card ? if so think it would be viable for the spider once more ? The deck lists were sent in before AW was banned in constructed. The card remains banned in constructed but usable in draft or sealed deck. On the subject of Nexus (as I've only just read this thread), the clause is there to prevent us getting hosed in draft. You can thank Chris Medico for that, as it was an interaction that would undoubtedly have hamstrung us in the format.